When you build an SUV, at least nowadays, it’s got to really be something for the world to notice. There are so many crossovers, compact crossover, and something above and in between that are on the market today that it’s hard to really keep track. Soon it seems the crossover SUV market will be as saturated as the market of sedans which makes automakers certain they better keep building better SUVs than ever and give the public what they seem to be clamoring for. The Volvo XC60 certainly appears to be the SUV with all the right stuff to make a great choice for anyone to drive and have a fun ride that is also one full of safety. Playing in a class with the Lexus RX, BMW X3, Audi Q5 and Acura RDX the XC60 is one of the best luxury SUVs on the market and as you would expect from Volvo, leads the way in safety to give us a great SUV for the whole family. The only real new change for the XC60 has been a progression of sorts. As a new model just two years ago the SUV gained two four-cylinder engines last year and this year it loses the six-cylinder to become even more fuel efficient across the board. Speaking of engines, let’s see what the XC60 has to offer. The base engine is the 2.0-liter turbocharged inline four-cylinder engine which brings in 240 horsepower and 258 lb.-ft. of torque. This is attached to an eight-speed automatic transmission and is only offered in FWD to bring in a fuel mileage number of 24 city/31 hwy mpg. The same engine is used on the next model with the same transmission but it adds a turbocharger and supercharger to bring the power number up to 302 horsepower and 295 lb.-ft. of torque. This version loses a little for the fuel mileage and comes in at 22 city/30 hwy mpg. The first AWD model show up with a 2.5-liter turbocharged inline five-cylinder engine that comes with 250 horsepower and 266 lb.-ft. of torque. This is attached to a six-speed automatic transmission and shows itself with fuel mileage of 19 city/26 hwy mpg. Two more AWD models are offered which both use the same transmission and use a 3.0-liter turbocharged inline six-cylinder engine. The first one offers 300 horsepower and 325 lb.-ft. of torque while offering a fuel number of 17 city/24 hwy mpg. The R-Design is the top end and with a bit of added turbocharging comes in at 325 horsepower and 354 lb.-ft. of torque while keeping the same fuel number. All models of the XC60 can tow up to 3,300 pounds to make for a bit of fun. It wouldn’t be a luxury SUV if we didn’t take a look at the features. For the XC60 the T5 (base) model comes with skidplates on the front and rear, the City Safety system, a five-year/50,000 mile warranty with complimentary factory scheduled maintenance, steering wheel mounted audio controls, power windows, Bluetooth phone and music interface, 18-inch wheels, a 160-watt eight-speaker sound system and a tilt/ telescoping steering wheel. Moving up to the AWD models only moves up the engines and transmission that is included, but not the features on the base offerings. The optional features is where most luxury vehicles make their claim. For the XC60 this list includes the Tech Package that offers Lane Departure Warning, Collision Warning, Pedestrian and Cyclist Detection, Adaptive Cruise Control, the Road Sign Information system, an in dash navigation system, a dual screen rear seat entertainment system, a 12-speaker premium sound system, integrated rear child safety seats, a panoramic roof with a power sunshade, a walnut steering wheel, a Climate Package that adds heated front seats, rear seats, steering wheel and windshield and a Sport Package that adds a stiffer suspension and sportier appearance. 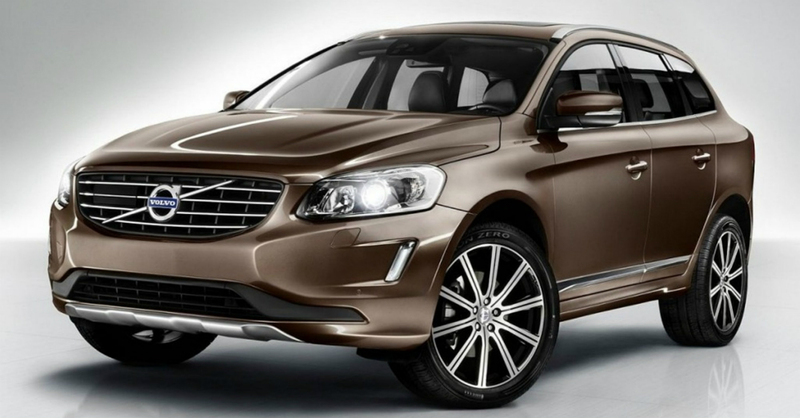 Other than features you want a luxury SUV to have a great drive and the XC60 does just that. This SUV has a great suspension to keep the vehicle and all your passengers feeling safe and secure. With added sound deadening materials you will have a quiet ride. Although it’s a luxury SUV it’s pretty clear Volvo wants you to test it out in the outdoors and off road areas; why else would they have put skidplates on the front and back of the vehicle?